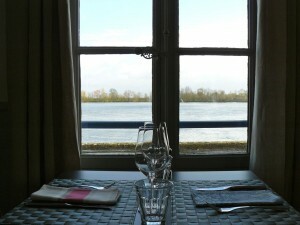 Le Thoureil is one of the prettiest riverside villages in the Loire valley and until now has been missing just one thing – a decent restaurant. Nothing too formal, something relaxed, some good wines, somewhere you can call in and have a glass of wine and a snack or a 3 course meal. Well, I’m pleased to report that we now have it. 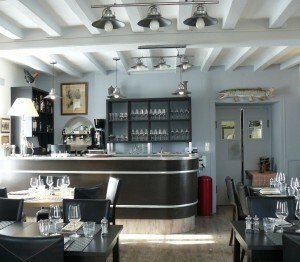 La Route du Sel is under new ownership and ticks all the right boxes. A perfect spot for lunch overlooking the river. Pop in for a glass of wine or enjoy a lazy lunch/dinner. The decor is soft and welcoming. 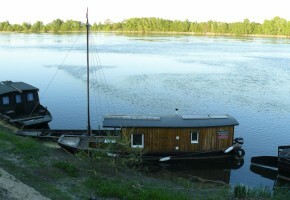 Marie Monmousseau and her partner Daniel Eastcott together with Guila & Dario are now at the helm of this delightful spot by the river Loire. 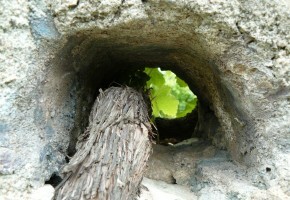 Marie is a a Loire lady and part of the well known Monmousseau wine family of Bouvet Ladubay. She and Daniel met in London when she was responsible for the UK distribution of Bouvet Ladubay and Daniel was wine buyer for a Belgian company specialising in the duty free market.Their careers took them in different directions – she trained as a chef and worked at Locatelli’s in London before spending 2 years in Dubai, time in Paris and back to London again to open Chabrot Bistro d’Amis. Daniel continued working in the London wine trade selling wines from all over the world to military outlets and embassies. 3 years ago, their paths crossed for a second time and this time it wasn’t just for business! 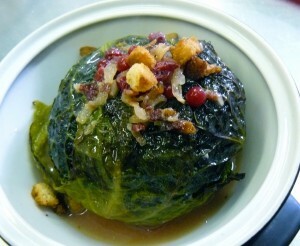 One of Marie’s specials – cabbage stuffed with veal, foie gras and chestnuts. Tasty and comforting. 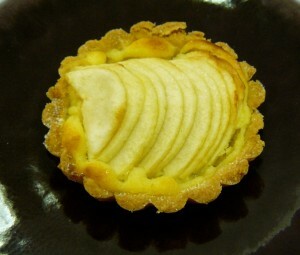 Individual apple tarts on the lunchtime menu. And always one or two additions to the menu. 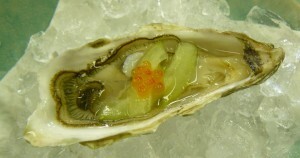 Oysters served with cucumber, salmon eggs and lemon. 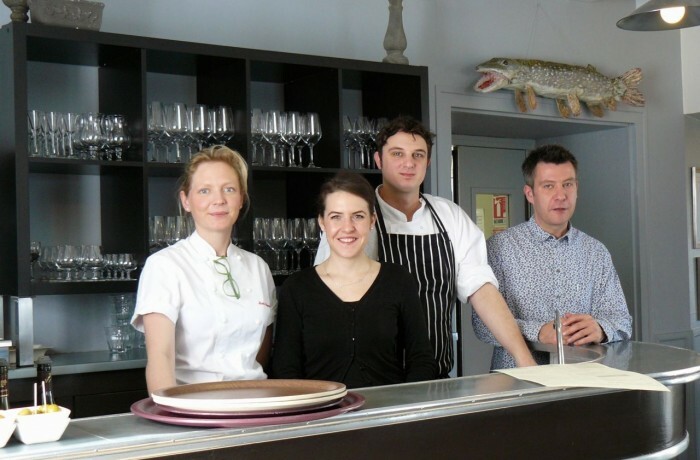 In 2013 they made the move back to the Loire and today with 8 month old Marcel and a basset hound called Humphrey, La Route du Sel has reopened it doors. So, what makes it different from other restaurants in the region? Well, the menu for a start. 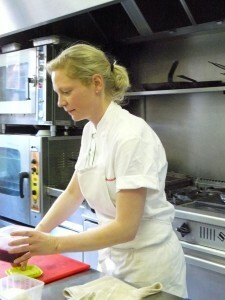 Marie has created a whole host of dishes that are classic yet have a twist that comes from her own experience. Starters are for sharing (or not), mains include home made confit of duck and entrecôte frites but you can also order a whole roast chicken, stuffed with foie gras and served with a selection of roasted vegetables and share it with the table (we had this last time we were there and it was delicious – comfort food with a difference). Pasta is made on the premises by Dario and I enjoyed the lightest gnocchi with truffle shavings the first time we dined there. The combination of Italian, French and English influences makes for a great combination. Even the desserts are a little different – the gateau de Marie is a rich gooey chocolate pud sprinkled with sesame seeds and is something that she cooked with her mother at the age of 3. The Cremet du Thoureil takes a classic local dessert of fromage blanc and whipped cream and adds little meringues to the mix making it somewhere between a traditional Cremet and English Eton Mess served with red fruits. 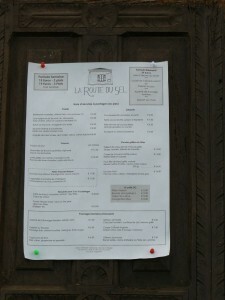 The menu is diverse and changes on a regular basis. 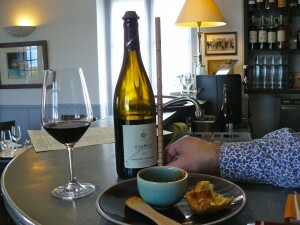 House wine is served by the bottle and measured by the baton. You pay for what you drink. Here served alongside warm duck liver paté and a giant cheesey gougère. Pop in for a glass of wine early evening or relax and and spend the evening. The wine list is comprehensive with a great choice by the glass, and house wine is served by the baton (you are brought the bottle and pay for what you drink). For those of you seeking something a little different there’s even a selection of wines from elsewhere, yes, elsewhere including the Rhone, Languedoc and wait for it, yes, even the New World (heaven forbid what is going on in a French restaurant?). You can thank Daniel for that, he brings his passion for wine and admits he’s had a fabulous time putting the list together. All very refreshing. Add to all this the location and you can get the picture now. 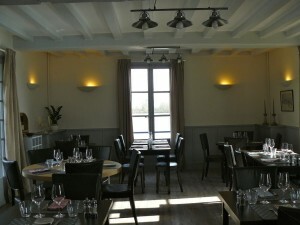 I can honestly say that La Route du Sel has one of the prettiest dining rooms around, has amazing views over the river Loire and a beautiful terrace and garden that will be open during the summer months. 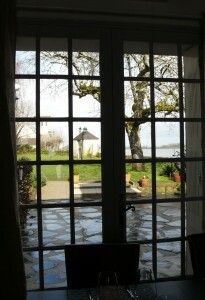 The restaurant inside has 36 covers but with the terrace and garden operating you can add another 80 or so to that. With the ancient church as a backdrop and the water in front, it is a beautiful place. 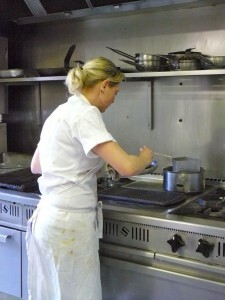 Marie hard at work in the kitchen. Dishes are simple but served with attention to detail. 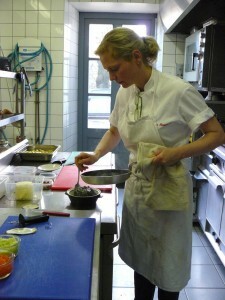 Marie takes classic dishes and adds her own touch. Eating here won’t break the bank either – you can enjoy 2 courses for 15€ or three for 19€ lunchtime and evening during the week and the weekend menu offers 4 courses for 29€. Don’t feel restricted by this though, relax, unwind and share, pop in for a glass of wine and a nibble early evening on the way past or while away a couple of lazy hours enjoying the view as you dine. The pretty church of Le Thoureil provides a lovely backdrop. 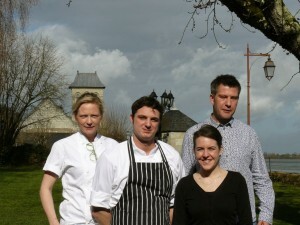 The team behind La Route du Sel – Marie, Dario, Guilia & Daniel a great combination of cultures, languages & experience. 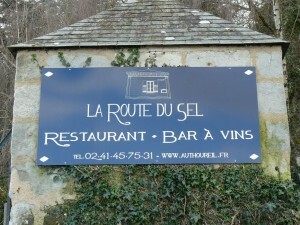 La Route du Sel is open Tuesday to Sunday. 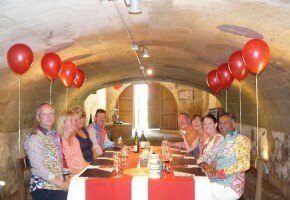 Reservations can be made by email on contact@authoureil.fr or by telephone 02 41 45 75 31. A website is to follow shortly. This majestic ‘fleuve’ gets under your skin and once you’re smitten, that’s it. Come and see for yourself and you’ll understand. 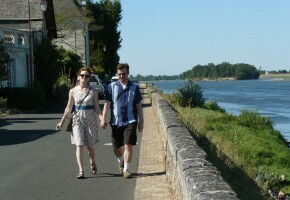 I don’t think I’ve ever seen the Loire so low in the 11 years that we’ve lived here. It was pretty low in 2011 but I don’t think it’s been this low. 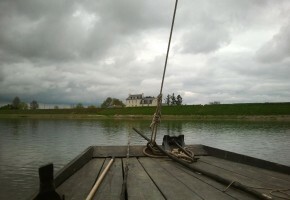 Fancy sleeping on a boat on the river, moored in one of the prettiest riverside villages in the Loire valley? 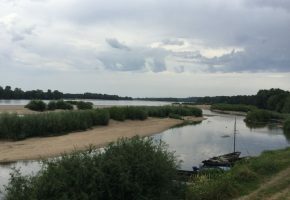 Whether you’re in the Loire on holiday, staying in Paris, with family and friends or business colleagues – a day in the beautiful Loire countryside is always good for the soul.